On July 19, approximately 30 thirty youth from the Montreal summer camp La ruelle potagère became biologists in training during Nature Days in the Laurentians. The day was organized by the Nature Conservancy of Canada (NCC) and supported by HSBC Bank Canada. 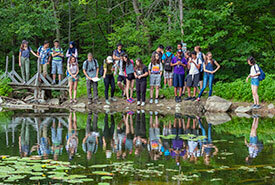 These young Montrealers, aged between 11 and 18, had the opportunity to get out of the city to see conservation in action and explore the plant and animal species within the rich ecosystems of the Alfred-Kelly Nature Reserve. The day’s activities focused on discovering various species, their biology and habitat. This exceptional natural environment is home to species with special status, such as the peregrine falcon and reflexed rockcress. On arrival at Prévost, the young biologists were divided into two groups. Equipped with sketchbooks and identification guides, the students went off to search for plants, animals and insects. The first group, accompanied by a botanist, started off with a hike to discover the plant species growing along the ecology trail leading to Lac Paradis. Among the plants observed were ironwood, bloodroot, and American beech trees marked by black bear. The second group, guided by two biologists, went searching for wildlife living around Lac Paradis. These young naturalists observed species such as green frog, turkey vulture, Eastern wood-pewee and downy woodpecker. At lunch time, both groups gathered at the lake’s outlet for a meal in the grass. In the afternoon, they swapped roles to benefit from the full experience. The young participants enjoyed the plant and wildlife learning activities and had a lot of fun. The day was a great success! The facilitators were also very happy with the activities, which lasted all day. Mark Tomalty, a professional photographer who is also a veteran birdwatcher and an NCC volunteer, beautifully captured the day’s activities.